株式会社吉村综合不动产鉴定咨询 Yoshimura Planning & Appraisal Co.,Ltd. 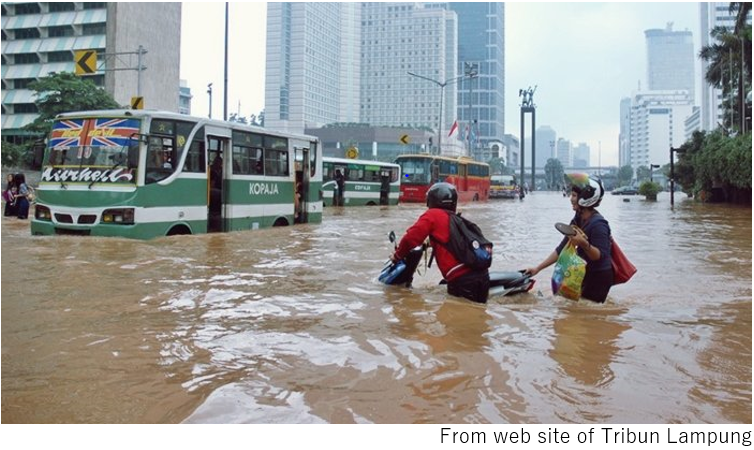 Another specialty of Jakarta is banjir (banʤiːr). Jakarta has the tropical rainforest climate and the maximum temperature throughout the year is 30 degrees to 33 degrees. Considering the terribly hot summer of Tokyo in recent years, it may rather be more comfortable to spend the summer in Jakarta. Jakarta has a rainy season and a dry season, and during the rainy season from November to April, squalls and thunderstorms usually fall almost everyday. The rain that falls in the mountains such as Bogor in the south has made an underground water vein and the ground is soft. In the northern part of the city that faces the Java Sea, you can spot areas where the ground subsidence has progressed and the roads are lower than the water level of the rivers and canals. As soon as heavy rain falls, they tend to flood. In such a case, Japanese companies fall into a situation where the local staff cannot go to work because of Banjir. It can be said that the society is tolerant enough to accept such things? It is feared that the ice on the Arctic and Antarctic will melt due to the global warming and the sea level will rise. BBC reported in August 2018 that Jakarta is the fastest city to submerge in the world, and that it is in danger of submergence by the year 2050. Based on these, a project called National Capital Integrated Coastal Development (NCICD) Master Plan or Giant Sea Wall Jakarta is proceeding. They are planning to make a landfill offshore, in the shape of the Garuda, and the former suzerain Netherlands is offering technical assistance to this project. Lets pay attention on how it will be proceeded. © 2019 Yoshimura Planning & Appraisal Co.,Ltd.